Nancy Bailey - Working boats, Porthleven, Cornwall - Online gallery supplying original fine art. Trending Modern British and Contemporary Welsh. Available for sale from Big Sky Fine Art; this original oil painting by Nancy Bailey. The painting is presented and supplied in a sympathetic and contrasting contemporary frame to suit the subject colouration. The “Herston” canvas by the Daler Board Co Ltd is signed again on the reverse along with the title and the inventory serial number 773.<br> <br> Nancy Bailey was born in 1913 and started her working life at the age of 15. As a teenager she used her father’s camera to take photographs of West Country views, many of which were used to produce postcards, which sold throughout the country. This early talent demonstrated her knowledge and appreciation of light and composition that later enabled her to create the beautiful paintings for which she became internationally renowned. Her family moved frequently throughout the south west, before settling in Ireland where for thirteen years she produced high quality marquetry pictures, which sold all over the world. <br> <br> Nancy only started painting seriously when she returned to Cornwall in her fifties. Her painting career, though started somewhat late, continued over forty years. Nancy worked with a palette knife and never used a brush. This gives her work its distinctive texture and captures the landscape and light. Nancy became acclaimed as one of the leading palette knife artists in the UK. <br> <br> Although Nancy travelled widely, including a safari trip to South Africa with the acclaimed nature artist David Shepherd her best work is arguably of the coasts and rivers of the West Country, which she loved so much.<br> <br> Nancy died in 2012, since when demand for her original works has increased.<br> <br> This original oil on canvas demonstrates the artist’s use of impasto technique with the palette knife. It depicts the working port of Porthleven, near Helston in Cornwall. It is the most southerly port in Great Britain. We see three wooden fishing vessels of modest size, moored in the harbour. Two men stand on the harbour walls, sorting out fishing pots and nets. The largest of the vessels is predominantly black, the next is white and the smallest is pale blue. Along the far wall of the harbour are commercial buildings, one of which is picked out in blue. The sea is calm, the tide is low, as we can tell from the marks on the harbour walls. The overall scene is a pleasing one, of quiet activity and bright colours. Available for sale from Big Sky Fine Art; this original oil painting by Nancy Bailey. The painting is presented and supplied in a sympathetic and contrasting contemporary frame to suit the subject colouration. The “Herston” canvas by the Daler Board Co Ltd is signed again on the reverse along with the title and the inventory serial number 773. This original oil on canvas demonstrates the artist’s use of impasto technique with the palette knife. 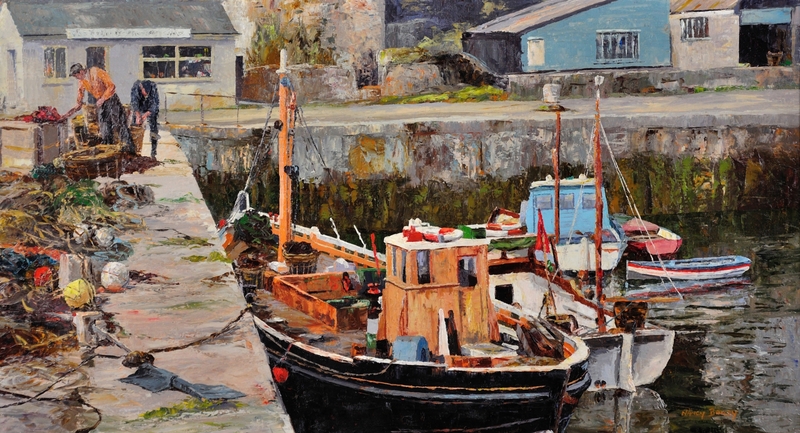 It depicts the working port of Porthleven, near Helston in Cornwall. It is the most southerly port in Great Britain. We see three wooden fishing vessels of modest size, moored in the harbour. Two men stand on the harbour walls, sorting out fishing pots and nets. The largest of the vessels is predominantly black, the next is white and the smallest is pale blue. Along the far wall of the harbour are commercial buildings, one of which is picked out in blue. The sea is calm, the tide is low, as we can tell from the marks on the harbour walls. The overall scene is a pleasing one, of quiet activity and bright colours.